Nothing’s worse than accidentally locking your keys inside your home or car in the middle of a busy day full of errands and urgent appointments. 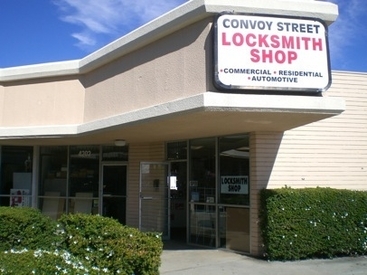 When you need a prompt locksmith in San Diego, CA, count on Convoy Street Locksmith Shop for all your lock-out, car lock repair, and re-key needs. 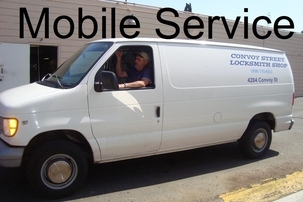 We specialize in commercial, residential, and automotive locks and even provide same-day service during our business hours. Whether you’ve left your keys in the car at the grocery store or the lock to your home or business was damaged during a break-in, our skilled team can get you back on schedule with minimal hassle. Get in touch with us today to schedule lock-out assistance, automobile re-key, or other types of lock repairs or services. There’s always a sense of urgency when it comes to broken locks, misplaced keys, or malfunctioning electronic lock components. Our locksmiths always arrive to your location promptly and work quickly to get you back inside your home, business, or car so you can continue with your day. Contact us when you’re in need of a locksmith for your car, home, or business. We proudly serve clients in San Diego, California, and the surrounding areas. Many transponder keys and auto remotes in stock. Programming included with all purchases. House and business locks re-keyed. Car locks repaired and re-keyed. to request our locksmith services today. Convoy Street Locksmith Shop at your service!